Hoarding - Where Are You Putting My Stuff? You are here: Home / Articles / Hoarding – Where Are You Putting My Stuff? Hoarding – Where Are You Putting My Stuff? When it comes to hoarding, this is a fear that most hoarders are faced with at some point in their life, especially when the authorities order them to clean up or ship out! MayKen understands cleaning up a hoarders property is more than just removing junk, there is a requirement for compassion, diligence and even acting responsibly to help the individual out where ever possible. Last year a middle aged lady called us with fear in her voice. She owned her own apartment but with many neighbours complaining, the Condo Board had no choice but to evict her because of many previously ignored notices. They had reached the end of their rope and there would be no more extensions. This dead line was final and it was fast approaching. The following Wednesday was that day and we could hear it in her voice, she was feeling anxious and the panic was setting in. Not knowing what the process was or how to go about it, she searched the internet for information about hoarding and potential help cleaning up her property and she found our company MayKen and asked us for help. And help we did. We went to see her the next day. Upon our arrival, we called her to meet us at the front door, as she previously requested and she came to greet us at the main apartment doors. We then took the elevator up to the ninth floor and stood in front of her apartment door while she put her key in the lock to let us in. She was shaking profusely and at that point I wasn’t sure if it she was nervous or if she had a condition causing her shakiness. I noticed the dirt on the door and walls and the soiled carpet in front of her door leading to the hallway and could easily understand the condo boards reaction. As she successfully unlocked the door, we were immediately surprised that it only opened a few inches, just enough for her and I to fit through. Since my partner couldn’t fit, he had no choice but to remain in the hallway waiting for me as I viewed her two-bedroom apartment to answer her questions to get some idea on how much this would cost? And how long it would take us to clear out? We couldn’t see the floor as it buried, so we had no idea what shape it was in, so in our experience of giving her a quote became all dependent on the condition of the unseen. In this case, it was based on a daily quote with the number of staff members and hours worked. This included the disposal bins but the disposal fees were extra. In situations like this, where we’re unsure of what could be buried or hidden beneath the mountains of stuff our Personal Protecting Equipment (PPE) is of utmost important in protecting our employees and their families. It requires us to be dressed in Tyvek suits with hoods and booties over work boots and N95 respirators, with both nitrile gloves and leather work gloves. In this property the contents and debris ranged from a three feet deep compacted walkway, to as high as the ceiling in some areas which involved covering most furniture (level 5). I was working closely with the client picking and sorting through her important items, while the other two team members were removing obvious debris with her permission. All salvageable items were packed up and placed in boxes and taken to a storage room. With a staff of three, we were able to clear out her apartment in two days with exceptions of one extra staff member assisting for one day hauling the heavier appliances and furniture. Abiding by the Condo board and residence rules and by-laws, all debris and contents removed from the premises must be bagged and discreetly hauled through the hallway, down the elevator to main floor where a dumpster bin was placed outside. Now that all the contents have been cleared and all the doorways and patio doors have been cleared allowing easy egress, we can concentrate on evaluating any damage to the floors and walls that we can now see and start the cleaning and sanitizing process, along with assisting in replacing appliances and furniture. With what looked to be an overwhelming task for this little elderly lady we were able to come in and quickly and efficiently help her get her world back in order. Not only did we impress her and help her out of what seemed an impossible situation, but we also found out the condo board was also impressed with out efficiency cleaning up a hoarder’s home. With continued support she tries to lead a clutter free life style but still needs constant support from her contacts to help her moving in a positive forward direction. Mayken is proud to be able to help people get past their hoarding and while we do provide hoarding cleanup services we can also provide organization assistance after the fact and with our many contacts in the industry we can also provide recommendations for further assistance to avoid falling back into bad habits. If you are a hoarder or know of one who needs assistance contacting us and requesting a free quote is at zero cost to you or the owner. We’ll come in, assess as best we can and provide you written estimates of the time and costs involved to return a home back to it’s original condition where possible. 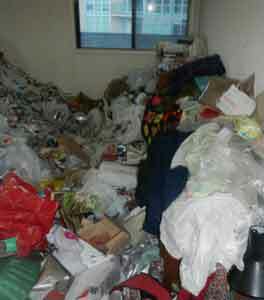 To read another article on hoarding, click here.